Yesterday I discussed how Peter Gabriel made a transition from Prog Rock to New Wave in the late 70s. Crucial to his path were the contributions of Robert Fripp, both as sideman and producer. Fripp was the lead guitarist in King Crimson, whom some would say were a definitive Prog Rock band. There were other hints of Prog that predated their debut in 1969, but after “In The Court Of The Crimson King” happened, all of a sudden, this strange new style looked highly viable to a host of also rans. As usual, photos help to tell the tale. 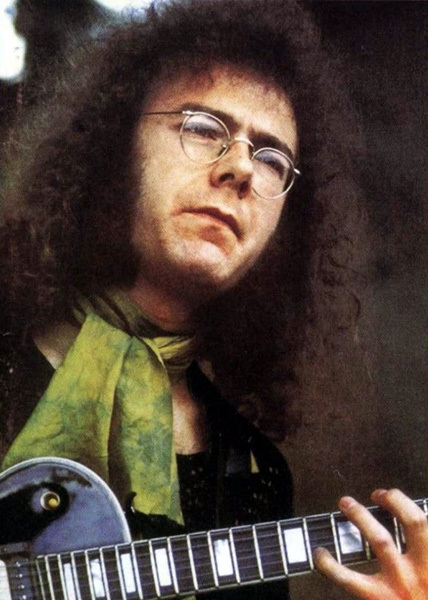 This is what Robert Fripp looked like in 1970 [L] and 1978 [R]. You have to admit, he made quite a transition. Fripp disbanded King Crimson after their scorching “Red” album of 1974. He had reached the end of his rope with big time rock music and took a three year sabbatical to study the works of J.G. Bennett; an English philosopher who was an acolyte of G.I. Gurdjieff. In 1977, his friend Brian Eno, with whom he had earlier recorded two albums of forward looking systems music [“No Pussyfooting” “Evening Star”], prevailed upon him to return to recording. He was working with David Bowie on his “Heroes” album and felt that Fripp could contribute something to it. Fripp flew to Berlin and soloed for a few hours to the playback of the master tapes and he took the album into the stratosphere. Bowie was already making moves in that year that would have a profound influence on Post-Punk with his earlier “Low” album; which featured a strong Krautrock influence and eschewed traditional song construction norms. When coupled with the one-two punch of “Heroes,” Bowie was assured of escaping “boring old fart” status amongst the new glitterati of Punk. The movers and shakers of Punk were all Bowie fans and these new records cemented his reputation with the next generation. Robert Fripp became swept along on this trajectory as well since it was congruent with the aims he was seeking to follow in his music. His distaste for rock star decadence found a sympathetic outlet with the intellectual cognoscenti of the New Wave. He went on to contribute guitar to Blondie and Talking Heads records of the time and in 1978, he released his first solo album, the genre-busting “Exposure.” Intended as a musical autobiography of sorts, the album has all of the hallmarks of his earlier work with King Crimson as shot through a different lens of the times. The trademark aggression/delicacy chiaroscuro is still there, but the lengths of the tracks are brief, never overstaying their welcome. The many guest vocalists included Van DerGraf Genrator’s Peter Hammill, Daryl Hall and Peter Gabriel, who recut a vastly superior version of “Here Comes The Flood” that left the blustering original on the first Peter Gabriel album very much in the shade. Next, Fripp cashed in his guest star chips and saw further collaboration with Byrne of Talking Heads as elaborated on here. After several instrumental albums of Frippertronics, he made the great leap of his “Drive to 1981” as he called it, when he formed the New Wave dance combo “The League Of Gentlemen.” It’s members comprised Keyboardist Barry Andrews, fresh from XTC, Sara Lee [who would later cement her New Wave credentials in Gang of Four and the B-52s], and the very punk sounding drummer Johnny TooBad. The resulting album featured largely minimal instrumental tracks over which Fripp’s furious playing is abetted by the farfisa organ of Andrews. At no time does the mind wander to Roger Dean paintings while listening to it. Fripp next played on David Bowie’s “Scary Monsters [and Supercreeps]” album of 1980 before taking all that he had drunk in during the ’78-’81 period and making his next move; forming a new band. At first, they were known as Discipline, but as they neared the wire to the release of their album, the name reverted to King Crimson. This was a King Crimson that was informed by all he had recently experienced and as such, sounded more like Talking Heads than the band that had recorded “In The Court Of The Crimson King” a dozen years earlier. Truthfully, the last incarnation of King Crimson in the 70s made perfect sense as a precursor to the new Crimson. The Bruford/Wetton/Cross/Fripp lineup that made “Lark’s Tongues In Aspic,” “Starless And Bible Black,” and “Red” were not at all similar to the bulk of what made up mainstream British Prog Rock at this time. Consider the bloated, diffuse and yes, unlistenable “Tales Of Topographic Oceans” by Yes as an antithetical example. In contrast, in ’73-’74 Fripp was helming a unit that can be considered proto Post-Punk in their aggressive art rock stance. 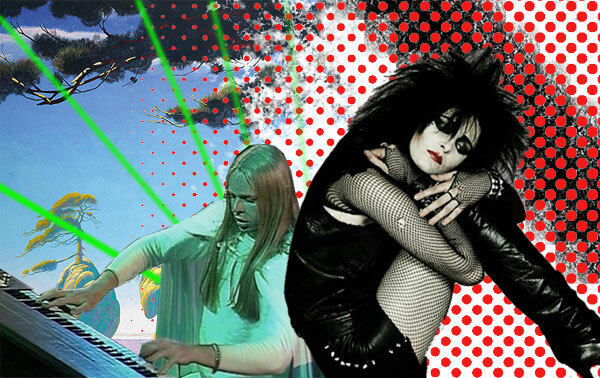 After the turmoil of Punk in 1977, the bands that came back next would be picking up the threads that Fripp and Eno wove during their time in the wilderness of the early to mid 70s and begin weaving a new tapestry. This entry was posted in Your Prog Roots Are Showing and tagged David Bowie, David Byrne, Robert Fripp. Bookmark the permalink.